segway | Let Teddy Win! 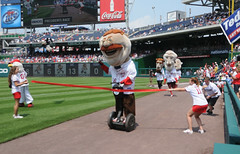 The Nationals racing presidents once again stretched beyond the boundaries of track & field as their week of Olympic tributes continued at Nationals Park. After taking on swimming on Friday, the mascot team stayed in the virtual water Saturday with their own unique take on an Olympic sailing regatta. 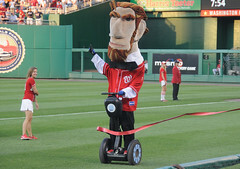 George, Tom, Abe and Teddy entered the field aboard Segway personal transporters, each of which was fitted with a sail. Alas, the wind was no help to Teddy Roosevelt, who brought up the rear for loss #497. Video: Presidents race twice. 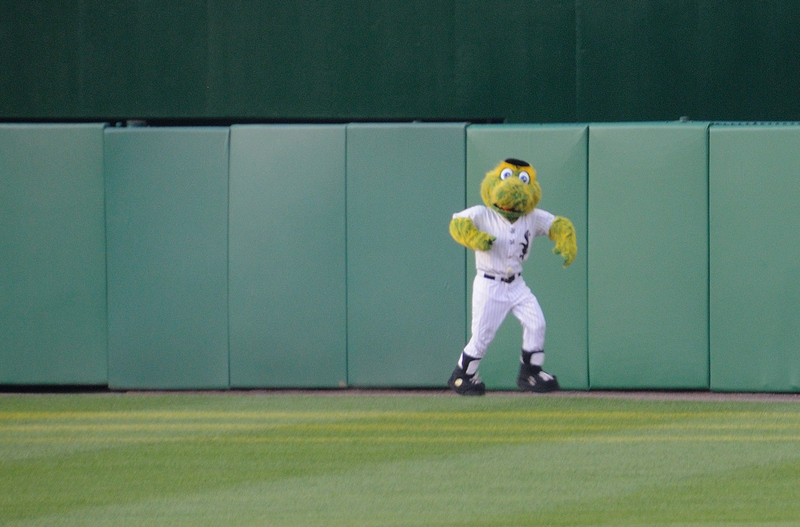 Abe ambushes Teddy in the 13th inning. TJ takes two. 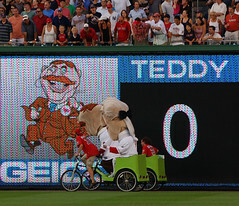 As promised, the Nationals moved the presidents race back to the first base line for Friday’s outing, but despite getting a rare second chance, the result was the same for poor Teddy Roosevelt. 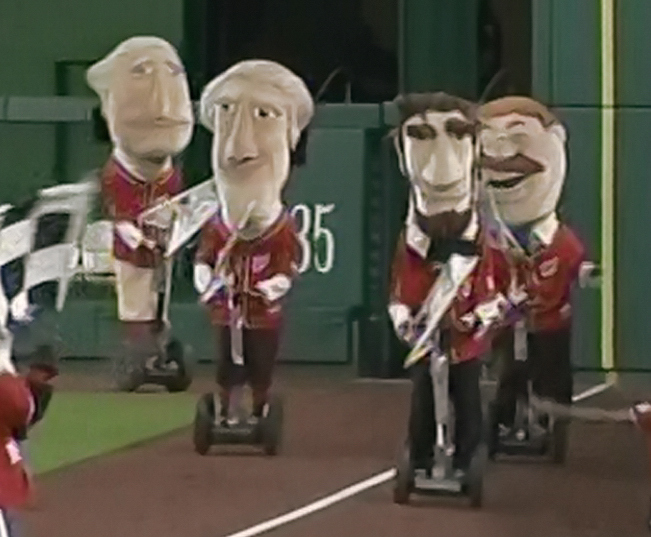 In the 4th inning, the presidents competed aboard Segway personal transporters, and despite his height, Jefferson managed to outmaneuver the other racing presidents, speeding around Teddy to take the victory. 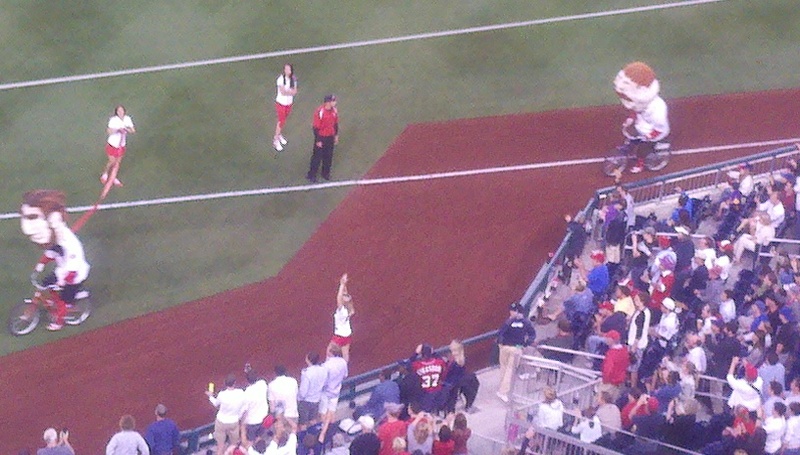 Fans in attendance got a rare treat when the game stretched into the 13th inning: a second official presidents race. It was the ninth such opportunity in Nationals history — an opportunity that was wasted on Lincoln, who chose to hide in the bullpen instead of participate, then jump out mid-race to ambush Teddy Roosevelt. With Teddy on the ground, Jefferson and Washington burst by and made it a two-man race, with Tom edging George at the wire to take an unprecedented 3-0 lead in the standings after just two home games. In the final game of an undoubtedly difficult homestand for racing president Teddy Roosevelt, our 26th president decided it was time to leave nothing to doubt. Unfortunately for Teddy, he could have picked a more subtle way to cheat. 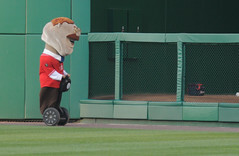 When the presidents emerged in center field for the 4th-inning race, Teddy was out in front aboard a Segway personal transporter. The other presidents were on foot. Tom, Abe, and George struggled to keep up in the 98-degree heat, and Teddy held the lead from wire to wire. The crowd erupted as Teddy broke the tape with a fist raised high in victory, but the cheers from the crowd ended moments later, when Screech jumped in. 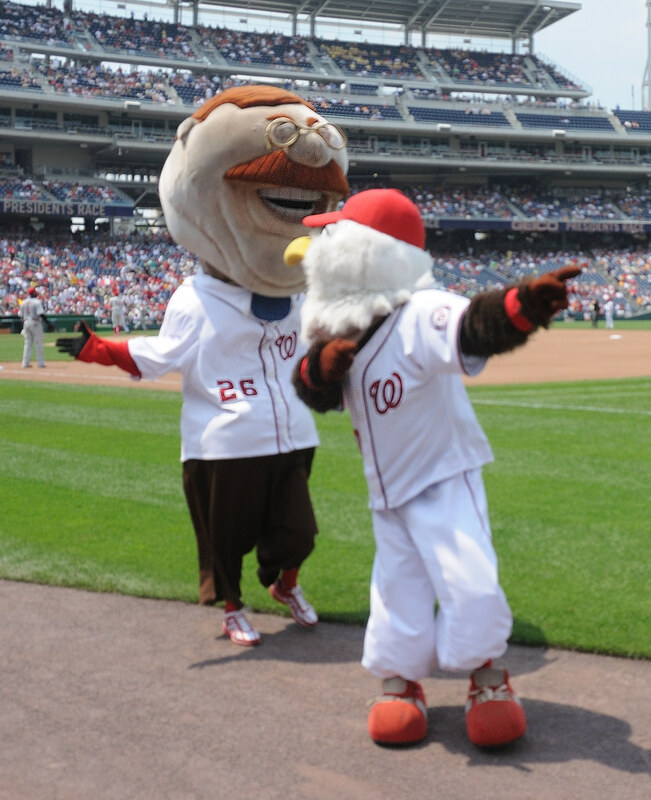 Never one to put up with Teddy’s antics, the Nationals’ mascot and presidents race judge quickly interrupted Teddy’s victory dance and waved off the victory. After disqualifying Teddy for riding the Segway, Screech awarded the victory to Thomas Jefferson, provoking a rain of boos from the crowd. After taking the series from the Phillies, the Nationals now hit the road for an extended trip west, giving both Teddy and Screech some time to cool off.